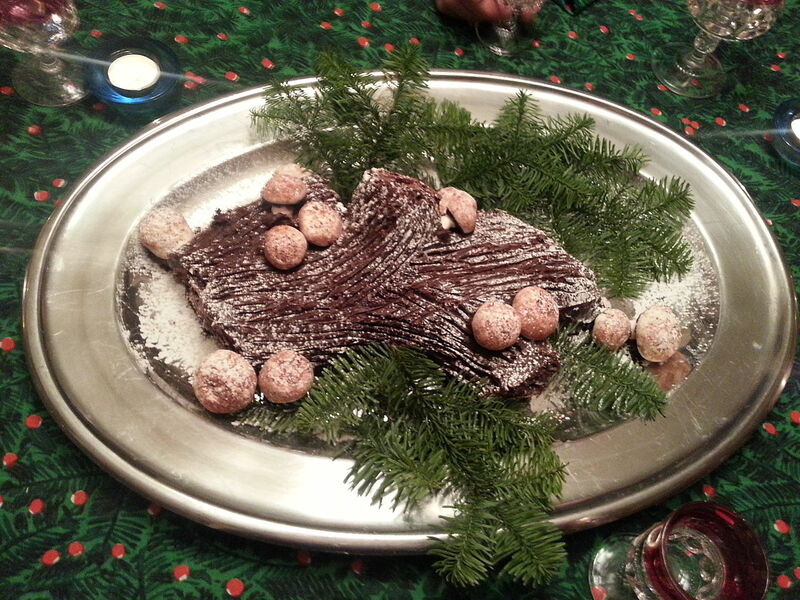 Once upon a time, when I was quite ambitious in the kitchen, I decided to let out all the stops and make a Yule Log for our family Christmas celebration. The Yule Log originated in France as Buche de Noël, a classic Christmas dessert that resembles something you’d toss onto the fire on a chilly night. I won’t bore you with the recipe ingredients. Just gather your favorite cake, filling, and frosting recipes and ingredients, along with a bottle of your favorite alcoholic beverage. I like brandy since that always adds a festively intoxicating zing to any holiday dessert. Stick with me and you too can wow your family and friends with a dessert “Yule” never forget, a classic Buche de Noël in ninety-nine quick, easy steps. First, make the cake batter. Add a splash of brandy if you like. Pour the batter into in a jelly roll pan, a shallow baking pan with one-inch-high sides. Unfortunately, jelly roll pans tend to warp when heated. So after about fifteen minutes in the oven, you’ll hear a large clang. This is the signal for you to place a heavy, non-combustible weight on each corner of the pan to keep it flat and prevent the cake from ending up two inches thick on one corner and an eighth-inch thick on the opposite corner. Chunks of last year’s fruitcake work nicely as weights. Bake until done. Remove the cake from the pan when it has cooled. Celebrate by adding a splash of brandy to your mouth. Next, make the filling. Raspberry, strawberry, and vanilla are popular flavors. A splash of brandy is a fine addition too. Spread the filling onto the cake. And what the heck, give yourself another splash of brandy for the old gullet, eh? Now, roll the cake up into a log shape. That’s the first fun part, because as we all know, a thin, flat, rectangular cake with goopy filling slathered on top is so pliable and easy to roll into a tight little log that a two-year-old could do it. (More on two-year-olds later.) If you’ve managed to get this far and actually have a cake shaped like a log, not a pile of woodchips, celebrate with three fingers of brandy in your favorite Christmas glass. Ice optional. If you haven’t produced something that looks like a log, now’s the time to zip down to the local convenience store and pick up a gallon of ice cream and a dozen day-old, chocolate-covered doughnuts as a substitute dessert. Assuming a long, tubular mess is not scattered about your counter, you are now ready to apply the tree bark to your Yule Log. Chocolate is a good choice since, like most tree bark, it’s brown. One could digress and go for a white birch look, but if you’re going to this much trouble to frost a cake, it might as well be chocolate, right? A generous splash of brandy can be added to the frosting, and another shot of brandy down your throat helps your creativity. It’s not enough to slather on this frosting like you would with a normal cake; the trick is to make that frosting look like real tree bark. Most bakers tend to go for smoother-barked trees such as young maples. Not me. I go for scraggly old cottonwood, with deep, roughly parallel grooves. If you’re a trained sculptor, this will only take a few minutes. For the rest of us, allow at least thirty minutes. Now it’s time to make the branches. This is where the process can get challenging, because you’re now seeing two logs instead of one. From experience, I know the log closest to you is the real one, and the imaginary log is blurrier. The branches can be pieces cut from a second jelly roll cake you had the foresight to make. Or you can really think ahead and bake a bunch of mini-cakes shaped like individual tree branches. Actually, it’s easier to show where branches used to be by creating the look of a sawed-off branch only sticking out an inch or so. Two or three of these are enough. Stick the branch nubs onto the frosted log in random locations. Celebrate with another shot of brandy. If you’re feeling quite warm all of a sudden, now’s the time to open the windows and let some fresh air in. Don’t do this if the outside temperature is below zero, however, since you won’t be aware you’re becoming hypothermic, and you want to finish your masterpiece, don’t you? Huh? Say, did I ever tell you I love you, man? Well, I do. I love you, man! Keep in mind if you go with the sawed-off branch theme, you have to make lighter-colored icing to put on the stump to contrast with the chocolate-brown bark. Adding twenty or thirty age rings on that sawed-off area adds a nice touch of realism, too. Easy to do on a one-inch-diameter branch, right? Only if you can find a pastry bag tip the diameter of a hypodermic needle. Do you have any idea how tiny those freakin’ age rings are? They’re freakin’ microscopic! But I still love you, man. Celebrate with another chug of brandy. If the bottle’s almost gone, now’s a good time to bring out a backup. Now you look at the Yule Log and think, “That looks pretty good, but something’s missing. Ah ha! I’ve got it … hiccup … mushrooms! No, I don’t mean the psychedelic mushrooms you’ll need to consume because that’s the only way you’re going to finish this sucker without killing the cat or punching a hole in your wall. I mean meringue mushrooms. Save those psychotropic drugs for afterward. Suffice it to say unless you have some serious meringue-sculpting talent, stick with simple, garden-variety, button mushrooms. Whip up a batch and place them in strategic locations on the log. Crank out at least five or six—vary the sizes—and stick those onto the log. Some purists insist on one ‘shroom per serving. I worry more about the visual effect. Is my muse telling me this is a recently downed tree, meaning only a few mushrooms will have taken hold? Or has this sucker been dead for decades, and if not for those freaking age rings, no one in their right mind would have a clue this is a log? Take a break and mull over the mushroom placement with another snort of brandy before you make the final decision. Those mushrooms look starkly white against the brown bark, which is not natural, so you decide the mushrooms need a touch of dirt on them. Not real dirt of course, but cocoa powder lightly dusted over them. Et Voila, right? Well-l-l-l, not quite. It’s Christmas after all, so you need to garnish your masterpiece. Run out to the nearest forest, gather some holly leaves and berries, maybe a few pine sprigs, and nestle those around the edges in an artistic montage of winter’s struggle to defeat beauty and color, and the pine and holly berry’s ultimate prevailing over Old Man Winter. Celebrate with another brandy. I still love you, man … hiccup. You choke back bile and venom as you try to remain calm … and upright …hiccup. Then you think, “So this is how a serial killer feels just before he fires up the chainsaw.” Of course, the little tyke’s mom apologizes profusely. You shrug it off. “That’s okay, Aunt Bambi. He and the other little darlings can eat that section. We grownups will enjoy the three inches of cake not infected with toxic two-year-old germs and spittle.” You slice up what’s left of the cake and serve. When the adults are digging in to their piece of Yule Log, walk over to the expletive-deleted little runt with cake smeared all over his face and say, “I love you, man.” Then spike the monster’s apple juice with Red Hot Peppermint Schnapps. And you thought I was kidding! This entry was posted in Essays and tagged brandy, Buche de Noel, Christmas, dingdong, Euell Gibbons, Yule Log by CNWriter. Bookmark the permalink. ← Previous Previous post: NaNoWriMo is done–Success!